Maximum power handling is a common concern of our customers. Nothing is worse than plugging in an expensive device only for it to be immediately destroyed. Understanding power handling is important to us as well so that we can address customer concerns about reliability and to develop devices that are able to tolerate higher power levels. The purpose of this document is to describe the failure mode and maximum power handling of several Marki Microwave product lines. It lists the power required to destroy the device and describes what part of the device fails at that power. RF tests were performed by applying RF power to the input port of a device and stepping up power decibel by decibel while measuring the insertion loss at each power level, as illustrated in Figure 1. For devices with more than two ports, any unused ports were terminated with 50Ω loads. Power was increased like this until the device fails, which was determined as being when the insertion loss permanently degrades. Failure was confirmed by dropping input power below the point of failure, and comparing the insertion loss of the product at this lower level to what it was before failure. Afterwards, the part was measured using a PNA to further confirm failure by measuring the insertion loss across a broad range of frequencies. One of these traces is shown in Figure 2. Figure 1. Test system for performing RF tests. 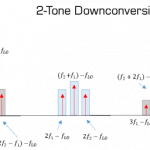 Insertion loss is calculated from input and output power. Figure 2. Insertion loss of a CBR16-0012 bridge coupler after failure, showing larger insertion loss than rated. Most of the tests were performed at 5.8GHz. However, during the project a poweramp failed and had to be replaced with one that operated at 6.8 GHz. 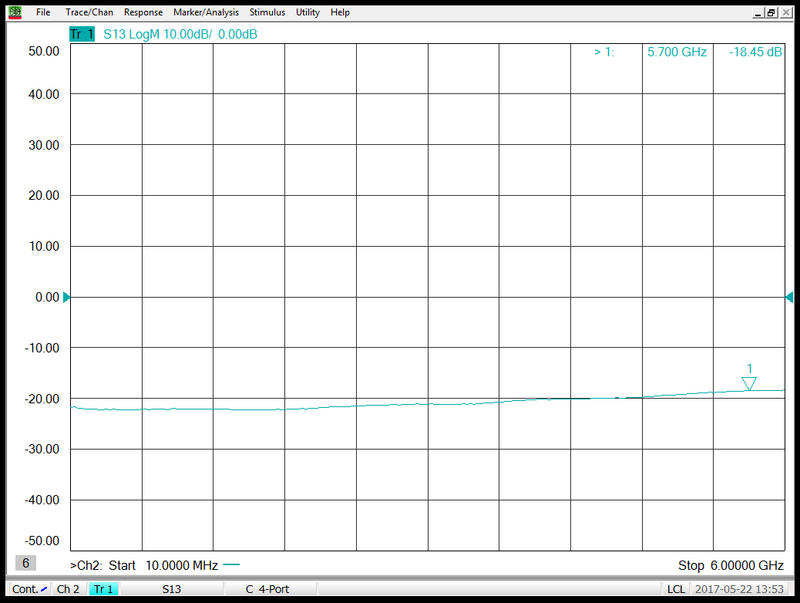 Therefore, the test frequency for the ADM line was 6.8GHz and all others was 5.8GHz. The upper power limit of the test system is 23W, as limited by the maximum output of the poweramp. DC tests were performed by connecting the device to a DC power supply and adjusting input current. Because the causes of failure for DC tests were heat related, devices were tested at a given DC current level for at least a day to give sufficient time for the components to warm up. Devices from the BT and BTN classes were tested by applying DC power into the DC port and out the DC+RF port, whereas devices from the BAL and BALH families were tested by applying power to the input port and out ground. This is because the input ports for these families are short to ground at DC. BALH: This is a product family of high power baluns. These products failed because the primary balun winding overheated and melted, shorting the conductors and causing most power to be reflected back to the input port. This failure mode was seen in both DC and RF tests. 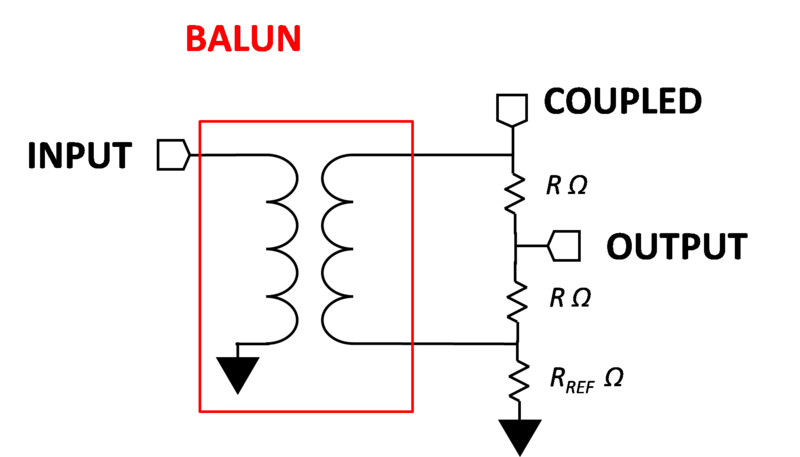 BAL: These products are also baluns but are not designed to handle as much power as the BALH family due to resistors used in the design. These resistors improve common mode return loss performance but limit the amount of power these devices can handle before failure. When high power is applied to the device, the resistors are the first components to fail. Applying more power causes the windings in the balun to fail like with the BALH line. However, DC current bypasses the resistors, so the failure mode due to high power DC is still due to the windings melting. The connectorized BAL0026 does not have any resistors and has circuitry inside with a thicker dielectric and lower gauge wire, so can handle much more power than BAL or BALH surface mounted devices. This device can handle at least 23W of power. Bridge Circuit used in CBR and PBR circuits. CBR: These products are bridge couplers. They are like directional couplers in that they couple power going in one direction across the device, but provide much higher directivity. This family of products fails when a resistor between the input and coupled ports burns up. This resistor is not along the main current path of the device and only directs a small fraction of input power to the coupled port, so the device can handle significantly more power than other products with resistors. This failure does not affect power delivered to the output port, but it does introduce additional insertion loss to the coupled port. PBR: This family of products are high-isolation power combiners. They are used for combining signals with different power levels that a power divider would not be able to combine. The failure mode of the PBR depends on the port, as well as if the device is surface mounted or connectorized. There are resistors along the path from the IN2 port to the output port, so when high power is applied to that port, the first parts to fail are those resistors. However, IN1 does not have any resistors along its path to the output. When power is delivered to the IN1 port, the surface mounted PBR failed due to the circuitry in the balun melting, like with the BALH family. However, the balun in the connectorized PBR has a larger wire. This one was able to handle much more power than the surface mount and only failed when the solder joint along the path to the output port reflowed. Either way, the maximum power that these devices can handle is limited by the resistors on the IN2 port. BT: This family of products are bias tees. These combine a DC block with an RF choke so that the user can inject DC current to a line carrying an RF signal. The failure mode of these devices depends on if there is a ferrite bead along the current path from the DC port to DC+RF. If there is, then the device fails because of a solder joint on the ferrite reflowing due to power dissipated by the ferrite overheating the joint. These beads are present in the BT-0018 and BT-0014SMG. If there is no ferrite bead, then the insulation on the inductor burns away due to the inductor itself overheating. Increasing current further causes the inductor to get hot enough to melt. For devices with a ferrite bead, the inductor still shows damage, but the first part to fail is the solder joint. Figure 3. Diagram of a bias tee. 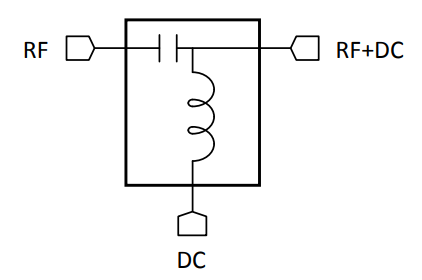 The DC block and RF choke separate DC and RF components of a signal. Ground is open with respect to all three ports. BTN1: These products are high power bias tees, which are built with lower gauge wires than the BT family. This family shows similar results as the BT group, but since it uses a larger wire, it requires more current for the insulation to burn or the wire to melt. T3: These products are triple-balanced mixers. These devices use a local oscillator signal (LO) to switch diodes that pass the RF input through to the intermediate frequency (IF) port, mixing the LO and RF signals together. This requires the LO to be much more powerful than the RF so that diodes are switched only by the LO. These mixers were tested by applying high power to the LO side and measuring insertion loss from the RF and IF ports. They fail because of the diodes and the resistor on the LO side. ADM: This family of products are T3 mixer drivers used for amplifying the LO signal. These distributed amplifiers fail due to the first gate contact along the input line being destroyed by the input power. The input power required to cause an ADM amplifier to fail is much greater than the saturated output power of the device, meaning that these units can be cascaded back to back to create a fast rise time square wave. This is the recommended technique to drive a T3 mixer with maximum dynamic range. For products with resistors, the first parts to fail are resistors, especially ones along the main power path. If there are no resistors in the device, the balun used in the surface-mounted devices fail due to the windings inside them overheating. However, the circuitry in the connectorized baluns do not overheat at such a low temperature due to their larger size. If neither a wire failure or a resistor failure can occur, the next likely failure mode is solder reflow. DC current in bias tees is limited by inductor failure or, if the circuit has a ferrite bead, solder reflow, with the reflow occurring first. At significantly lower powers mixers also suffer from diode failure and the amplifiers suffer from a blown gate contact, which is also a diode. Power handling is directly related to heat handling capacity, which is directly related to size. Since high speed integrated devices are much smaller than passive, purely resistive components they experience damage at much lower power levels.